This name uses Spanish naming customs: the first or paternal family name is Aravena and the second or maternal family name is Mori. Alejandro Gastón Aravena Mori (born 22 June 1967) is a Chilean architect from Santiago. He is executive director of the firm Elemental S.A. He won the Pritzker Architecture Prize in 2016. He was the director and curator of the Architecture Section of the 2016 Venice Biennale. Aravena graduated from the Pontifical Catholic University of Chile in 1992 and established Alejandro Aravena Architects in 1994. Aravena was a visiting professor at Harvard Graduate School of Design from 2000–05 and is the Elemental-Copec Professor at Universidad Católica de Chile. Aravena co-authored Los Hechos de la Arquitectura (ARQ, 1999), El Lugar de la Arquitectura (ARQ, 2002) and the monograph Elemental: Incremental Housing and Participatory Design Manual (Hatje-Cantz, 201). He was a member of the Pritzker Prize Jury from 2009 to 2015, and is an International Fellow of the Royal Institute of British Architects. In 2006, he became the executive director of ELEMENTAL, a for profit company with social interest. In July 2015, Aravena was named Director of the Architecture Section of the Venice Biennale, with the responsibility for curating the 15th International Architecture Exhibition to be held in Venice in 2016. Aravena designed the "Siamese Towers", a workshop building at the school of architecture and faculty buildings at the Universidad Católica. He designed the Colegio Huelquen Montessori; the Casa para una Escultora (House for a Sculptor); Casa en el lago Pirehueico (House on Lake Pirehueico); Hunt, Le Mans and Johnson residential halls of St. Edward’s University in Austin, Texas; art workshops on the Vitra campus at Weil am Rhein; Villa en Ordos Inner Mongolia (Villa in Ordos Inner Mongolia) and projects for the Elemental initiative. He also designed a children's playground at the Metropolitan Park of Santiago. Aravena won the Silver Lion prize at the XI Biennale in Venice, the Erich Schelling Architecture Medal in 2006 and was a finalist for the Mies van der Rohe Award (2000) and the Iakhov Chernikhov Prize (2008). He received a Global Award for Sustainable Architecture in 2008. He was a 2011 Index award winner and won a Holcim Awards Silver for Sustainable Construction (region Latin America). Exhibitions of his work have included a showing at Harvard Graduate School of Design in 2004, the São Paulo Biennale in 2007, the Triennale di Milano in 2008 and the Venice Biennale of Architecture in 2008 and MoMA, New York in 2010. In 2016, he was awarded the Pritzker Architecture Prize—the most prestigious recognition to architects. From 2009 to 2015, he was a member of the Pritzker Architecture Prize jury. ^ Publishers, Hatje Cantz. "Elemental | Architecture | Hatje Cantz". www.hatjecantz.de. Retrieved 2016-01-29. ^ Lusiardi Federica. "Venice Biennale - Alejandro Aravena curator of 15th Architecture exhibition". Inexhibit. Retrieved July 19, 2015. ^ "Arquitectura Pública Reciente - Giancarlo Mazzanti y Alejandro Aravena". Plataforma Arquitectura. ^ info@lafargeholcim-foundation.org, LafargeHolcim Foundation for Sustainable Construction. "Sustainable post-tsunami reconstruction master plan". holcimfoundation.org. Retrieved 2016-02-24. 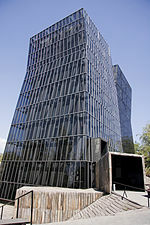 Wikimedia Commons has media related to Alejandro Aravena. This page was last edited on 13 December 2018, at 18:13 (UTC).